Firing down the tarmac in Audi’s latest new S3 Sedan would seem like all my dreams had come true. Over the rise ahead, as I continued in my smugness, was a tight bend that swept over a right-hand change in direction. As the speedometer indicated 153 km/h, the enlightenment occurred at the top of the incline that I’d better start slowing down. A quick change of focus had me slowing down fast and taking the corner at what would be faster than comfortable speeds. Audi’s S3 felt completely in control as the brakes bit hard, and the Quattro traction held the car true throughout the bend. Many other drivers may well feel quite at home at these speeds, but for me, the adrenalin rush would be enough to last me another six months before heading off for a sky dive. What I was instantly left with was an appreciation of how in control the new Audi S3 Sedan actually is. Over many different types of roads and surfaces, the phenomenally capable S3 Sedan owes this to its ingenious designers at Audi who built the superb Quattro drive-train and chassis. Performance isn’t everything once the corners start arriving! It’s a very pleasant cabin space inside the latest S3 Sedan. Impeccably crafted, the interior is comfortable for long journeys. High-tech and tastefully made with tactile and beautiful materials life is good inside the smallest Audi sedan. Options for colour schemes include the ever popular black leather seating and upholstery, however the ivory and red colours look quite exceptional for making a statement that’s a little different while remaining very luxurious. Thankfully, when the engine is required to heat the rubber outside, the audible power from the TFSI engine is not completely muted. A growl can be heard when the Audi S3 Sedan really gets down to business. Other than when the performance credentials of the S3 Sedan are explored, the mid-size Audi is quiet and very refined. Long journeys are a breeze travelling in the S3 Sedan; good room – particularly in the front, a compliant ride and all the very best comfort and entertainment available for the drive means that everything is taken care of right up to cup-holders for a coffee and hands-free phone communications for keeping in touch with friends or clients. A nicely blended feeling of modern sophistication and tangible luxury are what driving a car of this kind of quality and pedigree is all about. Other striking Audi S3 Sedan interior features include a distinctive flat-bottomed multifunction sport leather steering wheel, the already-mentioned fine Nappa leather seat upholstery which also boasts shoulder inserts in a diamond patterned stitching, pedals made of brushed stainless steel and the latest in Audi’s MMI navigation. The touch screen presents itself up on the centre of the dash. If you want one of the nicest cockpits in the small-to-medium-size performance car bracket, the Audi S3 Sedan makes a very credible claim for top spot. It’s the complete deal: quality craftsmanship, style and luxury make it so nice. German quality makes the difference. Yes, the S3 sedan looks neatly modern, but it’s the way the doors close, the fit and finish of the panelling and the quality materials used which make the driving experience in an Audi so special. Sometimes cars might look fantastic, but it only takes a short time to discover that the packaging and build quality are not up to Audi’s high levels. 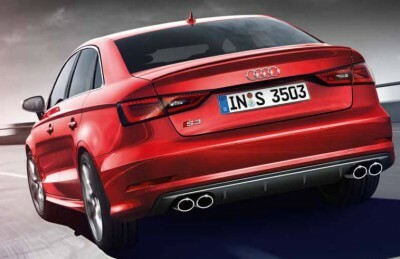 On the point of build quality; the new Audi S3 Sedan is rated with the full five-star safety. An array of electronic driving aids and airbags, along with a super strong safety cage enable you to be in one of the safest cars in its class on the road. If what you’re after is performance in smaller dimensions, then the 206 kW TFSI engine linked to Quattro propulsion should be enough to send you grinning from ear to ear. There are very few cars of this size that can match the Audi S3 Sedan in a 0 to 100 km/h dash in 5.0 seconds flat. Add to this the fact that the drive is evenly distributed to all four wheels, then your performance world has just got a whole lot larger. The electronically controlled differential distributes variable amounts of drive force to the front and rear axles depending on what the demands of the drive are. Driving is fun in an Audi S3 Sedan! Economy and performance walk hand-in-hand, with the S tronic transmission combining the low fuel consumption of a manual transmission with the benefits of an automatic. Drive a new Audi S3 Sedan, and let your hair down, just a little! For any more information on the Audi S3 Sedan, or for that matter any other new car, contact one of our friendly consultants on 1300 303 181. If you’d like some fleet discount pricing (yes even for private buyers! ), we can submit vehicle quote requests out to our national network of Audi dealers and come back with pricing within 24 hours. Private Fleet – car buying made easy!